The following provocative essay was written by Maranda Elizabeth, who is an identical twin. It was originally published on a site called The Establishment on January 19, 2016. It is reprinted here with the author’s permission. As an identical twin myself, I am often asked this same question. And Elspeth’s answer exactly captures my sentiments. If you’re not a twin, how can you possibly know what it is to be one? Being a twin is like being me. What is it like to not be a twin? I wonder what people mean when they inevitably tell me that I’m so lucky—that they wish they had a twin, too. Do they wish they had a best friend? A partner in crime? Somebody to share their secrets with? To keep them safe? To hold their hand? A twin can be those things, but they’re also so much more (and sometimes less. And sometimes something else entirely). And yet, these nuances are often ignored in favor of broad characterizations. We are secretive. We share clothes. We share secrets. We are too close. We are either exactly the same or totally opposite—nothing in between or around. Most of all, we are strange. The fictional twins of my childhood were not characters whose lives resonated with me, usually due to the fact that they grew up conventionally attractive and middle-class—yet I read and watched them anyway, because twins were neat. Because, despite our differences, I still identified with them. 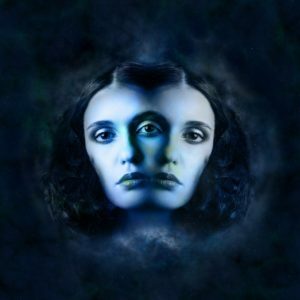 I found that, in the fiction of my younger years, twins were often portrayed as playful tricksters, often switching places and pretending to be the other one, playing practical jokes, and sharing a secret language that nobody else could understand. I read the Sweet Valley series for longer than most people my age would care to admit—from the beginning of the Kids series, through much of the University series. 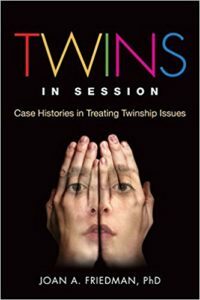 The Twins series contains more than half a dozen books in which Elizabeth and Jessica switch places, sometimes with one another’s consent, and other times, not so much. Typically, Elizabeth switches places with Jessica in situations where she can help her (like proving that boys will still date girls who wear glasses), but Jessica will switch places when she can steal something from Elizabeth (like boyfriends and babysitting money). And then there’s their traditional April Fool’s Day switch, which gets enormously out of control when, instead of pretending to be each other, they pretend to pretend to be each other, exaggerating their own style and characteristics. As I grew older, twins in fiction changed. Instead of being the bright-eyed tricksters full of fun and adventures, we became the ghostly, ethereal, strange people appearing in horror and fantasy, haunted by old secrets and telepathic connections. A quick search for twin-related art on Etsy brings up reinterpretations of The Shining twins in their blue babydoll dresses, conjoined twins in circus sideshows, and identical twins holding hands, their hair braided together, as well as whimsical art dolls, often splashed with fake blood. Common tags in listings of twin art include: strange, spooky, weird, horror, dark, macabre, unusual, surreal, Halloween. In White Is For Witching by Helen Oyeyemi, Miranda, the older, fraternal twin of Eliot, dies in the first sentence. Eliot is still searching for her, calling a phone number she hasn’t answered for months, and sliding I’m lonely notes under the door to an empty bedroom. The house is haunted. Much of the story is told from the point of view of the house Miranda is buried beneath. Eliot has a memory of Miranda, who has a disease that makes her crave chalk and plastic instead of real food, climbing into the giant fireplace and sputtering strange noises, attempting to reproduce the sound of a fire crackling, before choking on dust. He is always able to know which sound Miranda is trying to make, and the meaning of the sound, regardless of whether or not she is successful. In Her Fearful Symmetry, by Audrey Niffenegger, Julia and Valentina are the identical twin daughters of Edie, who has a twin sister named Elspeth, who has recently died (within the first sentence, again), and left them an apartment in her will. An apartment which is, of course, haunted. Not only are Julia and Valentina identical, they’re also mirror twins: they have matching moles and freckles, one is right-handed while the other is left-handed, and one twin has her heart on the left side, the other on her right. Although they’re in their early 20’s, Julia and Valentina still wear matching outfits, hold hands, share lipstick, and sleep entwined in the same bed. Recently, I found a book at the library called Black Heart Blue by Louisa Reid, and I could not help but smirk at the description on the cover; I texted it to my twin immediately, so we could laugh and snark together, despite living some 500 miles apart: “Twin sisters. One beautiful, one disfigured. Divided by a family secret . . ” We agreed that we both heard it in the dramatic voice of a movie trailer. I haven’t been able to finish reading it. These books seem to describe a kind of inherent loneliness with twins, as though we are forever pushed together and pulled apart, unable to define our own boundaries. We are too close, too entwined, too enmeshed, attempting to untangle ourselves, separate ourselves, become individuals—but whichever direction we go, too close or too far, it’s never enough. Each novel has a twin who clings too tightly and a twin who struggles for freedom, a twin who is closer to weird and a twin who is closer to normal, a twin who is mad and a twin who is sane, an ugly twin and a pretty twin, an introvert and an extrovert. (The most classic example of this may be Elizabeth and Jessica from Sweet Valley High; one bookish and silent, the other popular and rebellious.) The stories feel romanticized and exaggerated to me, though maybe that’s the point. What the fictional accounts ignore is that no set of twins can be these either/ors; no twin can be so easily divided, despite our separateness. As the stories unfold, the lines blur, the binaries disintegrate. We are not either/or; we are both/and. My twin and I, although identical, are not too difficult to tell apart in childhood photos. Generally, she is smiling and I am not. She is dancing and I am not. We often looked somewhat bewildered, dressed in matching clothes, not exactly alike, but coordinating outfits in pink and purple. The first time I told my twin that I didn’t want to wear matching outfits anymore, she cried and we were late for school. And although we don’t play tricks on anyone, we did communicate telepathically when we were very small, and switched cribs before we learned how to speak, to trick our mom, who had a panic attack and collapsed in our doorway and cried as she realized how much work we were now going to be. Now, in adulthood, you can still tell us apart by my purple hair and her pink hair, though we are often confused when someone mistakes one of us for the other, as we seem to be changing more and more as we grow older. I frequently joke that I am the sick one, the crazy one. I’d be Sue, Elspeth, Valentina, Miranda. I’m the weird one. I was born first, but I was removed from my mother’s arms and placed inside an incubator, separated from my twin, my chubby limbs pressed against the walls of a container that was too small for me, being treated for mysterious heart and throat troubles. Eventually, I was labeled with a personality disorder, and got a chronic pain condition for which I now use a cane. My sister has what I call “her own stuff”—we don’t have the same diagnoses, but it’s not as if I am crazy and she is not, or I am sick and she is not. We just have different stuff. We both write, but for different reasons. I live alone and she has roommates; I go to bed by 10:30 p.m. while she stays out until 4 a.m. at karaoke. We navigate our cities in different ways, our friendships and relationships, our own psyches. Sometimes my twin and I wonder if we should move further apart, try to maintain more separate lives, or if we should give up on everybody else, move in together, and get a bunch of cats. The twins in Her Fearful Symmetry and Twins both make note of which one is older and which is taller, and they assign meaning to these almost imperceptible differences. I am one minute older than my twin, but have always felt like she were older somehow; more responsible, more confident, more social and outgoing—more protective of me. I grew up feeling like she was the favorite, the one who did things first, and I followed, not quite sure if I was supposed to be doing the same, or something else, not yet able to figure out what the in-between-and-around was. This worry that she is better, smarter, cooler than me is, I think, only an illusion—neither of us is more or less of something; we are whole on our own. We each struggle with feelings of jealousy, comparing ourselves when we’d rather not (who’s more likeable? who’s a better writer? who’s more interesting? more fun? more creative? which one is better? ), and worrying others are comparing us, too, inevitably either choosing a favorite or treating us as though we are interchangeable, forgetting that we are different creatures with different feelings, dreams, values, memories, everything. We don’t want to be seen as the same, or as two halves of a whole; we have so many complexities to hold at once, and we need others to be able to hold these complexities, too. Unless you are one, you can’t possibly know. The image in this post is in the public domain courtesy of Geralt.